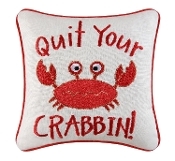 Quit Your Crabbin Accent 10 Inch Fun Coastal Red Crab Square Throw Pillow Our high quality pillows add a distinctive touch to your decor. They offer a quick and easy way to renew your decor with the season. Many coordinate with other home decor textiles in their collections for a great, pulled together look. Cotton covers with polyfill stuffing. 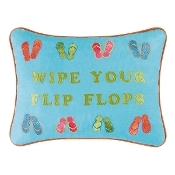 A border of colorful flip flops and "Wipe Your Flip Flops" in green decorate this blue pillow. 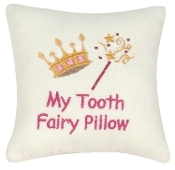 Pillow has a cotton cover with polyester filling. Great idea for any flip flop lover. 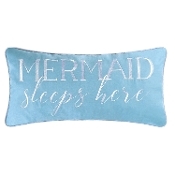 Mermaid lovers, this "mermaid sleeps here" pillow is perfect for you! You could also purchase it as a lovely gift for any mermaid-loving friend or family member. 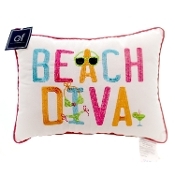 12x16" Embroidery Pillow, Beach Diva Our high quality pillows add a distinctive touch to your decor. They offer a quick and easy way to renew your decor with the season. Many coordinate with other home decor textiles in their collections for a... Add this cardinal throw pillow to your home decor as great focal point all winter long. 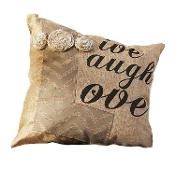 17.5x17.5 Polyester and Cotton Blend Decorative Pillow. White with HUGS sentiment design. Poly-filled. Spot clean with damp cloth. 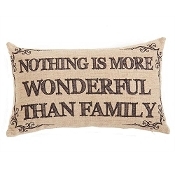 17.5x17.5 Polyester and Cotton Blend Decorative Pillow. White with KISSES sentiment design. Poly-filled. Spot clean with damp cloth. 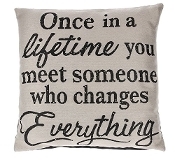 20x20 Polyester Decorative Pillow. Burlap design pillow with Farm Animal and sentiment. All you need is love, and a cat. Not everyone lives by that mantra, but you know someone who does. This is the perfect gift for them. A Beautiful and colorful throw pillow from Manual. With a pastel-like colorway and paint swatch design. Adorned with a motif, "Be Happy". Bring some brightness into your den! Let's pillow talk! 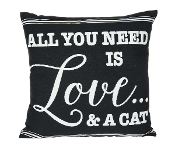 mix and match your style and attitude with this chic, double-sided pillow. Express yourself! Black Lab Dog 18" x 18" Throw Pillow Blue Boxer Pillow 18" x 18"
You will just love this black lab dog throw pillow. 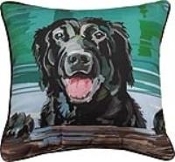 Pillow is 18" x 18" with red background to black lab. Made with cotton. 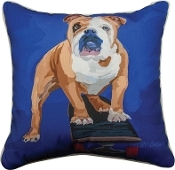 You will just love this Boxer throw pillow. 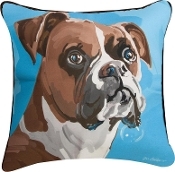 Pillow is 18" x 18" with blue background to the Boxer. Made with cotton. 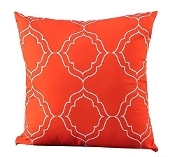 Decorate your home with these polyester blend large decorative pillows from Ganz. One for each spouse. Hello handsome and Good morning gorgeous. 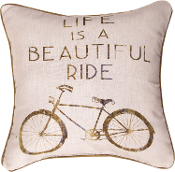 Decorate your home with these polyester blend large decorative pillows from Ganz. One for each spouse. 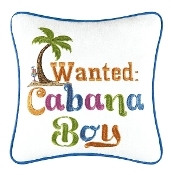 "I love him" and "I love her"
Colorful and bright, these decorative outdoor pillows from Giftcraft are sure to bring a bit of joy to your patio or poolside. For over 70-years, Gift Craft has earned the trust of retailers and consumers worldwide by offering a diverse array of on-trend decor, jewelry, apparel, accessories and giftware at competitive prices. 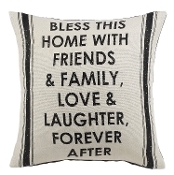 Ganz 'Bless This Home' Pillow Brighten any room with a trendy decorative pillow. Simple vintage chic design with modern appeal. "Bless this house with friends & family.". 16" square. Removable insert with loose fill. Polyester Imported Natural background Dry clean cover Comes with removable cover Great for children and adults, this colorful nightlight can be placed in any hallway, kitchen, bedroom, or bathroom to ensure safety and peace of mind. Beautifully crafted with detail and whimsy! Boxed for gift giving. Iron and glass. On/off switch. Orange Fish. 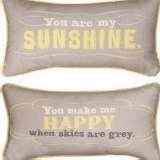 Ganz 'Bless This Home' Pillow Brighten any room with a trendy decorative pillow. 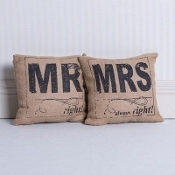 Simple vintage chic design with modern appeal. "Bless this house with friends & family.". 16" square. Removable insert with loose fill. Polyester Imported Natural background Dry clean cover Comes with removable cover This throw pillow makes a great wedding or anniversary gift. 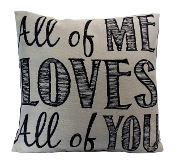 "All of Me Loves All of You" is a loving message fitting for couples or lifelong friends. 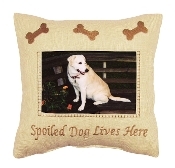 You will just love this German Shorthair Dog throw pillow. 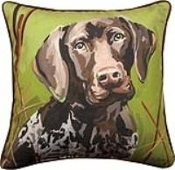 Pillow is 18" x 18" with green background to the German Shorthair. Made with cotton. 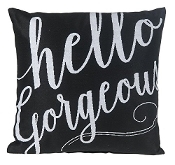 Hello Gorgeous, a throw pillow for you! 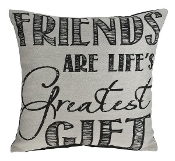 Decorate your living room with this sentimental throw pillow from Ganz. I Love You to the Lake 17" x 17" Throw Pillow is addition to home decor or lake house that any own would enjoy. Pillows are sold separately. Made out of polyester. Polyester pillow with "Let's Stay Home and Snuggle" sentiment on one side. Gray with elegant white typography, and white house design with red heart. 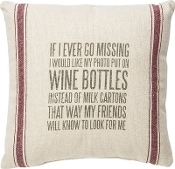 Decorate your home with these decorative pillows. A Beautiful and colorful throw pillow from Manual. With a pastel-like colorway and painted colorful pastel spot design. Adorned with a motif, "Life is Beautiful". Bring some brightness into your den! A fun take on classic camouflage, the Manual Camo Cat Decorative Pillow is a great addition to any cat lover's home. This rectangular pillow uses a variety of cats to achieve the look of camo. The humorous text on top completes the playful design. Spot clean only. From the mountains of North Carolina, manual WW weaves, sews, prints, and develops not just the fabrics, textiles, and beautiful products you'd expect from a Heritage company, they bring you the freshest designs for your home. 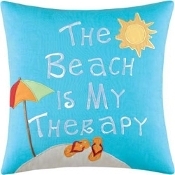 A great throw pillow with a mermaid seating on the sea. 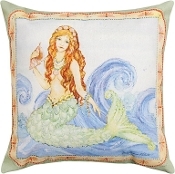 This mermaid throw pillow would be a good addition to beach house or themed rooms. The polyester pillow is approximately 17" x 17" in size. A beautiful mermaid designed throw blanket from Manual Woodworkers and Weavers. Weather Resistant Decorative Pillow. Red with white geometric pattern. 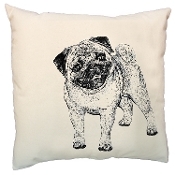 You will just love this pug dog throw pillow. Pillow is 18" x 18" with red background to pug. Made with cotton. 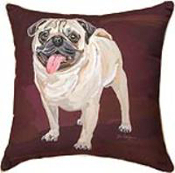 Hand screen printed decorative Pug pillow with polyester fiber fill. Screen printed and sewn in Bucks County, PA. Spot clean. This holiday dog pillow is short to be the talk of any festive event with two dogs sharing the spirit of the season. This beautiful Cardinal pillow is sure to be a great addition to any sitting area. The festive decoration of this white snow pillow, Cardinal, and holly leaves, will make it a focal point in any setting. Burlap design pillow with vintage pick-up truck. Some people age differently. 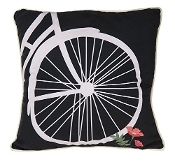 Decorate your home with this motif throw pillow from Manual. 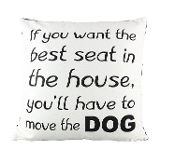 This hilarious and fun pillow is great for friend or family that says that they are not having children. Or a great gift the dog lover! 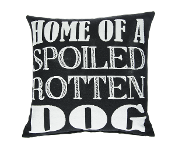 This great quality pillow is ideal for any room. Grab one while they are still in stock! 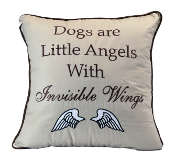 16" x 16" Quilted Pillow, Dogs are Little Angels Beach Therapy Embroidered Pillow, 16"
Giftcraft Decorative Throw Pillow, Love you to the moon and back A decorative throw pillow for your newly wed friends, or for your own personal space. Love is powerful, it can take you to the moon, and back! 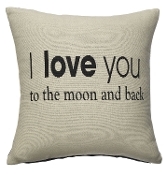 Reads: "Love you to the moon and back Size: 16" x 16" Made from polyester Giftcraft Satin Blue Iris Square Pillow Weather Resistant Floral Design Decorative Pillow. Blue, red and green color palette. Polyfilled Polyester. Water and mildew resistant. UV50 and treated fade resistant. 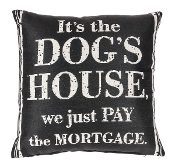 Decorative Pillow Polyfilled Polyester Weather resistant Fade resistant Measures 18" x 18"
It's The Dogs House Decorative Throw Pillow By Ganz Does your hound own the house? Does your significant other always baby the family pet? Does he or she secretly feed the dog as to make himself or herself the favorite? If so, then this is the... Love isn't just a feeling, its everywhere. It is always with you. Printed on this throw pillow, is a beautiful black sentiment "Love is Always With You". Make sure everyone knows it when they step into your home. Santa Claus Themed Throw Pillow A cute santa claus throw pillow is the perfect decoration for your home this Christmas, or can be a perfect gift for your home decorating addicted aunt or friend. Made with a blend of Wool, Polyester and Cotton Size: 18" x 12"